If you’re thinking about taking yoga classes in Littleton, you probably have some questions. To help you better determine whether this ancient practice is right for you, we’ve put together this list of five of the questions concerning yoga that we are most commonly asked. Of course, if you don’t find the answer you’re looking for below, you’re always welcome to give Club USA Fitness a call at 303-979-7772. The word “yoga” is derived from the Sanskrit word “yuj” which means to yoke or to bind. It is often interpreted as a method of discipline or a union. Female practitioners of yoga are known as yoginis while males are called yogis. It is believed that the practice of yoga originated an estimated 2,000 years ago in India with the Yoga Sutra, a collection of 195 statements that is also used as the basis of modern yoga. This guidebook also outlines the eight branches of yoga, including the yamas, niyamas, asana, pranayama, pratyhara, dharana, dhyani and Samadhi. Most modern yoga practitioners are focused on the third limb known as asana. This limb focuses on postures that are designed to purify the body and increase physical strength and stamina. Even if you only practice yoga for one hour each week, you will experience a number of benefits. However, doing yoga more often allows you experience more benefits. For most people, starting with two to three one hour to one and a half hour sessions is recommended in the beginning. However, everyone is different and you may find that you can handle more or less. As you become more accustomed to yoga, you will likely find yourself feeling compelled to spend more time practicing. 3. How is Yoga Different from Other Types of Stretching or Fitness? Yoga is more than just physical postures. While the physical aspect is a key component, yoga also teaches you to connect the movement of your body and fluctuations in your mind with the rhythm of your breath. By connecting the body, mind and breath, your attention is drawn inward and you become more self-aware. Yoga is a practice rather than a task to be completed, and it makes your mind more flexible as well as your body. 4. Can I Do Yoga if I’m Not Flexible? You don’t have to be flexible to do yoga. Practicing yoga will make you become more flexible just as taking piano lessons would make you able to play the piano. No matter your current degree of flexibility, taking yoga classes will give you improved agility along with increased strength, coordination and cardiovascular health. 5. What Do I need to Get Started? Unlike some activities, getting started in yoga does not require a lot of equipment. The main things you need are your mind, body and a willingness to learn! Yoga leggings are ideal, but shorts work just as well. Wear a t-shirt that is comfortable but not overly baggy. Since yoga is practiced barefoot, you don’t need to worry about special shoes. You may also want to consider bringing a towel and your own yoga mat. 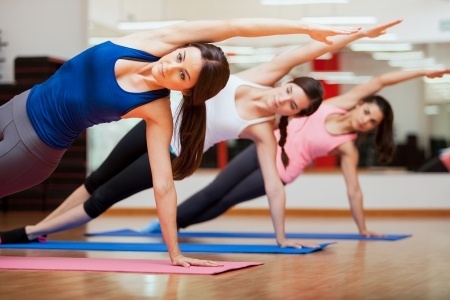 At Club USA Fitness, we offer a variety of yoga classes in Littleton that are appropriate for beginners as well as more advanced yoga practitioners. If you have any questions or would like to enroll in a Littleton yoga class, we encourage you to give us a call at 303-979-7772.